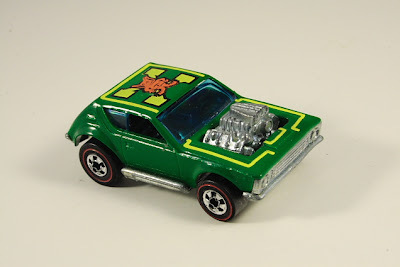 This Gremlin Grinder was made by Hot Wheels from 1975-1977. It never excited me very much as a kid but I find it growing on me lately. I remember in the early 70's we had a lime green Chevy Vega and an uncle who was 6"9. It was a lesson in physical comedy watching him try to get in the backseat of that car. Memory is such that I remember that car far more clearly than the second or third car I ever had. I like this Hot Wheel, and it's another one you can get in good condition rather inexpensively. It is also available in the super chrome version, which is actually far more common. For those who like shiny objects, the superchrome Gremlin Grinder is for you.